When fish target schools of baitfish in deep water, you have no choice but to chase them. To increase the catch rate, quality downriggers and sonar are a great combination. Clip weights, lead core line, and deep diving cranks are effective in targeting species at moderate depths. However, when fish are foraging or holding at depths of more than 40 feet, you are just dragging the baits without a downrigger. Now, you’re in the market and don’t know which is the best downrigger for you. Don’t worry, you’ve come to the right place, and I’ll show you how to choose one. At its most basic level, a downrigger is an ultimate method for fishers who target fish at great depths with a precise presentation. It is simply a coil of cable with a weight at an end. The weight carries the cable straight down into the water. Therefore, a hook which is attached to the cable is set at a predictable and specific depth. The angler attaches a line and hooks from an independent rod, instead of just rigging the cable with a hook. When the fish strikes, the line will pull free from the cable. At that time, the fishermen will have to fight the fish like other rod-and-reel fishers. Remember that fish have water temperatures and particular depths which they prefer. Thus, if you are an experienced fisherman, it’s easy to predict at what depth to set your lure to catch the fish. The cable is stainless steel wire. Some models use cable coming with temperature sensors. Therefore, you can figure out exactly what temperature the water is at a particular depth. This is very important when it comes to identifying the right depth. The reel is where they coil the cable, and there is usually up to 600 feet of cable. This part features a crank handle which helps pay out, wind up cable. Some reels have a counter so you can keep track of how much cable is paid out anytime. The clutch is what adjusts the tension on the cable. This is essential as the water can hide many obstructions, particularly in artificial reservoirs where there may be drowned forests. It enables the cable to pay out when something yanks hard enough. The arm is an adjustable piece, commonly made of stainless aluminum and steel. The cable runs along the arm before it drops down into the water. It works just like a fishing rod which holds a line. At the end of the arm, there is a pully and swivel head, and they keep cable movement smooth and continuous. This is the way the downrigger attaches to your boat. The mounting must help the downrigger be installed as well as removed quickly and simply. Also, to discourage theft, some mountings lock. It is the point of connection between the cable and the fishing line as the connection releases once a fish strikes. Released are attached near the weight, at the end of the cable, or anywhere else along the cable. A quality release can let go only when a fish strikes. The rod holder is where the fishing rod sits while you are waiting for the fish to strike the lure. Once the release lets go, the rod will spring up straight. This is also a signal that you have to grab the rod and fight the fish. In fact, there are two main types of downriggers available: manual and electric. However, recently, a lot of anglers have gone for electric downriggers. This is because you can quickly and easily bring them to the surface once a fish is hooked. It might seem like a luxurious choice, but if you’re fishing at depths of at least 75 feet, an electric one is your best bet. Remember that hand-cranking a heavy weight up and down a few times an hour can be very challenging to even the strongest anglers. Additionally, when you’re fishing alone, an electric downrigger is a particularly handy feature. You can also use one when you want to hook much large fish at the same time. A good electric downrigger is capable of automatically retrieving the line while you are fighting the fish. Also, it can stop once the surface is broken by the weight. High-quality models can interface with fish finders or fishing sonars; they also can automatically jig your lure for attracting fish. In spite of the numerous advantages of electric downriggers, manual units are still very useful, particularly when you fish from a small boat. Manual rigs are much more compact, and they can do the job effectively. In general, anglers use small boats to fish in freshwater or saltwater where the depths don’t dictate retrieving or running out much cable. A manual downrigger is also more compact as well as portable. Hence, it is a good choice for fly-in trips or fishing on rental boats. This is also a very important thing when it comes to choosing the best downrigger. To optimize performance, depending on the type of your boat, you can mount your downrigger in different positions. As I said, there are some small downriggers which have clamps tightened to your gunwale. On the other hand, some other units are mounted in one fixed position which offers durability and strength at the cost of flexibility. Specifically, a tilt mount offers only one mounting position which is completely fixed for fishing. However, it slants your downrigger inwards for docking. In my opinion, using swivel or pedestal mounts is the best way to mount a downrigger. As you can see, these are obviously advantageous. For examples, the mounts offer various locking positions and 360-degree rotation for maximum convenience and control during fishing. Furthermore, with these mounts, you can swing your downrigger out of the way for docking. If you don’t like drilling holes in the boat for several external mounting brackets, you can go for a gimbal mount. It slips into rod holders which are flush-mounted. Therefore, it can be a perfect substitute for you in this case. However, the downside of this mount is that you have to lift your unit out of the rod holder for docking. Portable rigs allow for easy and quick setup and removal. Hence, they are a great option for anyone who rents a boat or likes to position their downriggers in a variety of configurations. The problem is that this amount is less secure and can slip in heavy weather if it is not tightened properly. If you are used to fishing from a boat of 15 ft or less, you will find a short arm downrigger very easy to manage. These downriggers have a reach of between 20 and 24 inches, hence, allowing you to access while you’re sitting. That is a definite advantage, particularly in rough weather when nobody wants to lean over the rail of a tiny boat. On the other hand, for a longer boat which is about 22 feet long or more, a long arm unit is very beneficial and maybe mandatory. These arms fall in the range of 30 to 48 inches. Furthermore, they are a perfect choice for running different lines from both the stern and side at the same time. With the shorter 30-inch downriggers off the stern and the longer, 48-inch versions on the side, you’ll have much room to work. That means you can manoeuvre your boat easily without worrying about them on turns. Also, a larger boat with plenty of freeboards requires a longer arm to avoid banging the weight into the side if there are heavy waves. As mentioned above, while rigging a boat which falls into the middle zone, between 16 and 21 feet, it’s up to you. I mean you can go either long or short, depending on the number of downriggers you plan to use. Besides, in this case, you should consider how much you prefer to use the tool. Before drilling holes in a boat, remember to make sure of what you’re going to drill into, this will help secure a permanent mount. Additionally, don’t forget to check distances as well as angles between your planned setup. This is also very important if you want to buy the best downrigger. A rod holder should be adjustable so you can tilt it in different positions for the most effective relationship with the line trolled. Especially, you need a fishing rod holder which releases a rod with a fluid motion. The holder offers you solid hook sets and quick removal without fumbling delays. Besides, a good rod holder should be one that can withstand the stress of a large fish when it leaves at max speed in the opposite direction. It depends on which manufacturer products you want to buy. Overall, Scotty is well known for its horizontal design providing a low profile, thus, resulting in compact storage and easy winding. On the other hand, Penn and Cannon utilize vertical reels. However, I recommend you to fish on boats which have both of the styles, this way; you can know which reel is suitable for you. Every downrigger features a brake/clutch mechanism so that they are capable of controlling the retrieval as well as the deployment of weight. To be honest, it is a good idea to have both clutch and brake on your reel, for example, the one by Penn. This combination will be a perfect choice because of the one-handed operation which is very simple. First, you have to get the weight down to the right depth, second, you have to get it stopped. Remember that downriggers with an adjustable clutch brake do not only get it stopped but also do it gradually. Therefore, there will not be a hard jerk at the end which can twist or torque the ball. Positive ion control utilizes the electrical conduction of the cable for the emission of the positive ions to attract fish. However, in general, because we limit out, it isn’t obvious in case it is our skill or the PIC which makes the difference. This downrigger can give you total control of everything you need from a downrigger. With the newly designed LCD keypad, this unit is very easy for anglers to operate day or night. The keypad offers easy-to-navigate menus allowing you to be preset five depth settings. Additionally, control screen can display reading from the speed, depth, and temp sensor. Thus, you can raise and lower the weight, adjust positive ion control. Good for: any angler who needs a high-quality downrigger and is willing to spend a lot of money for it. It may lose bottom depth causing the downrigger to release too much or retrieve all line. This unit features a very simple belt driven design. You only need to draw power from the 12V DC batteries when you’re retrieving the cable from the water. It can lift up to 20 lbs, much stronger, compared to the 12 lbs in its counterparts. The supports of this one can endure the weight with the stainless steel boom which is 1.25 inches in diameter. You can get the 30-inch or 60-inch boom that folds to just 36 inches. The downrigger is ergonomically designed, so it’s very easy to use. Also, it comes with the Tension adjuster that allows you to double the tension if needed. With the extra tension, it’s easy for you to keep the line in its place until a fish strikes. The plug and socket design is not 10% waterproof. 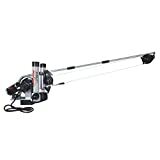 The Big jon downrigger ED04000 is one of the best choices of electric downriggers. It is highly recommended for any angler who is serious about competing in fishing tournaments. 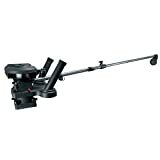 It is very easy to use as it’s loaded with special features such as a built-on cannonball holder, Auto-stop system, and Multi-set rod holders. You can adjust rod holders with only one hand and a tip-up boom which makes setting lines safe and easy. Besides, this unit is built of high strength aircraft grade aluminum. Therefore, it can last a lifetime. Additionally, the flexible boom can help reduce stress which causes the metal fatigue and cracking of fiberglass. Have you found the best downrigger for yourself yet? It’s not hard to find one if you know what features to consider in a downrigger. I hope you guys found the article enjoyable and my guide helpful.